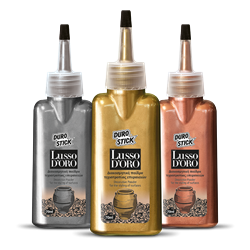 Decorative, ultrafine metallic pigments that can be used as mixing additives with the decorative acrylic clear solvent based varnish DECOLUX, yielding colors of gold, silver and copper. Use it in combination with LUSSO D’ORO BASE DI COLORI undercoat as a base coat on plaster, cementitious or ceramic statues, pots etc. to create antique looking patinas. Apply it on interior walls and floors. Apply it on an entire surface (e.g. a wall) or only an element of it (e.g. on a column or the fireplace) making the element fit into the aesthetics of the space by adding an arresting touch of luxury. An alternative application of the product is by broadcasting them on newly created cementitious surfaces, (when they begin to set), such as decorative pressed cement screeds DS-250, DS-252 FLEX and DS-256 FLEX VELVET. Use it also on decorative styling stuccos, such as MATIZ Stucco Decorativo and STUCCO VIVERE of DUROSTICK. After the surface has cured for at least a week, it can be coated with clear varnishes. • For broadcasting: Proportional to the aesthetic requirements of the application. • As additive: One vial per 750ml of DECOLUX varnish, covering 5-7m² per coat, on properly prepared surfaces, depending on their absorbency.